The Midnight Sun Road was an old abandoned project with the aim of creating more awareness for a road less travelled. You’ll find the Midnight Sun Road monument at the North Cape plateau just outside the main building before you go down to the globe. It is the road between Piteå and Nordkapp. The road includes a detour to Kiruna and a fork that includes both Alta/Skaidi and Jergu/Karasjok/Lakselv to destinations along the route. 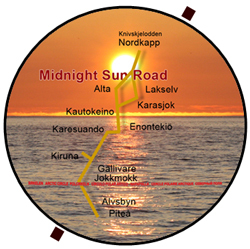 The Midnight Sun Road and Santa’s Road overlap each other on the stretch Karasjok – Nordkapp. In the tourist brochure of Nordkapp in 2011-12 this road was once again included on a map showing some of the destinations before you arrive and after you leave Nordkapp. The work took a new turn in 2012 when a roadumentary of the road was made. Blog post and film clips about what is on the Midnight Sun Road were published on www.visitnordkapp.no. After roadumenting the Santa’s Road between Rovaniemi and Nordkapp in 2014, some of the loopholes along the Midnight Sun Road left in 2012 were filled in 2014. Some of the loopholes were giants, whereas others were simply beautifully small. One key idea behind the different presentation is that they should complement each other. There are two national museums for the Saami culture along the roads we covered: One in Finland and the other in Sweden. A lot of the exhibitions are understandably quite similar. In these cases, the focus on our part has been to vary the presentations. For instance, our blog post about Ájtte – Svenskt Fjäll- och Samemuseum (Swedish Mountain and Saami Museum) in Jokkmokk does not necessarily deal with the most important exhibition of Ájtte. The blog posts have been complementary to what we already have of other Saami blog posts. All of these blog posts are written about experiences between Nordkapp and Piteå. They are in fact the accumulated knowledge of almost 20 years up and down this roads. So are the blog posts pertaining to Santa’s Road between Rovaniemi and Nordkapp. The third part is bonus diamonds between Luleå, Mounio and Rovaniemi.